Posted January 21, 2016 by admin & filed under White Bear Lake Auto Repair. When we think about brakes, the first thing we think about are the pads. This is the part that needs replaced most frequently and provides a fundamental function: Stopping your car. The brake pads are attached to your brake calipers (think of the pinching mechanism around a bicycle tire). When you apply the brakes, the brake pads grab on to the rotor on both sides. This pressure stops the wheel from spinning to slow and stop your vehicle. But not all pads are created equal. The first and most basic consideration: Size. The brake pads should touch the entire rotor so you have as much braking power as possible. When the brake pads are the wrong size, they won’t wear as they are supposed to. As you drive and apply the brakes they will start to wear down. If the brake pads are too small, you’ll lose braking power with normal wear and tear. You may struggle to stop your vehicle after a short time and the lifespan of the brake pads will reduce dramatically. If the brake pads are too big, normal wear and tear may lead to damage for other components. As they wear down, the overhanging material will remain the original depth. The brake pad may start rubbing on parts of the rotor it shouldn’t touch. Instead of gripping only the sides, they will also rub against the top of the rotors. 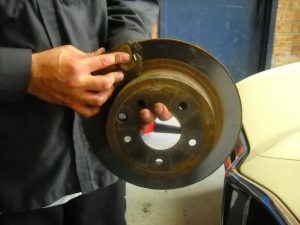 This may even prevent the brake pads from making contact with the rotor at all – which means your car can no longer stop! In both cases, your brake pads will need to be replaced early and more frequently. They should have had much more life, but because the brake pads were not the right size they will have a shorter lifespan. It may even lead to more damage and costly problems for the other components in the brake system. Don’t put your vehicle or your family’s safety at risk. Have your brake pads replaced by a certified, knowledgeable technician like ours at AM-PM Automotive Repair. Each of our technicians is ASE-Certified with years of experience to be able to guide you to the right brake pads for your vehicle. You’ll get the longest life of the brake pads, backed by our 36 month / 36,000 mile warranty, with the full stopping power your vehicle needs. To learn more or schedule a brake service, call our team at 651-426-0462 or stop by our auto shop in White Bear Lake.